The Respiratory System is vital to every human being. Without it, we would cease to live outside of the womb. Let us begin by taking a look at the structure of the respiratory system and how vital it is to life. During inhalation or exhalation air is pulled towards or away from the lungs, by several cavities, tubes, and openings. The organs of the respiratory system make sure that oxygen enters our bodies and carbon dioxide leaves our bodies. The respiratory tract is the path of air from the nose to the lungs. It is divided into two sections: Upper Respiratory Tract and the Lower Respiratory Tract. Included in the upper respiratory tract are the Nostrils, Nasal Cavities, Pharynx, Epiglottis, and the Larynx. 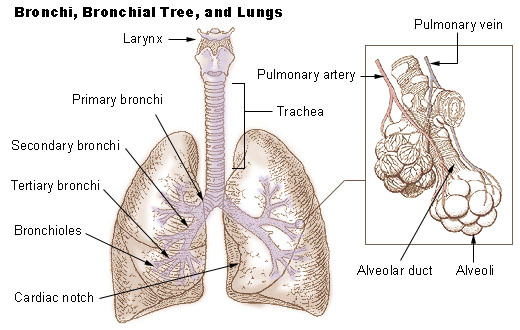 The lower respiratory tract consists of the Trachea, Bronchi, Bronchioles, and the Lungs. As air moves along the respiratory tract it is warmed, moistened and filtered. EXTERNAL RESPIRATION, which is the exchange of gases (oxygen and carbon dioxide) between inhaled air and the blood. INTERNAL RESPIRATION, which is the exchange of gases between the blood and tissue fluids. Ventilation is the exchange of air between the external environment and the alveoli. Air moves by bulk flow from an area of high pressure to low pressure. All pressures in the respiratory system are relative to atmospheric pressure (760mmHg at sea level). Air will move in or out of the lungs depending on the pressure in the alveoli. The body changes the pressure in the alveoli by changing the volume of the lungs. As volume increases pressure decreases and as volume decreases pressure increases. There are two phases of ventilation; inspiration and expiration. During each phase the body changes the lung dimensions to produce a flow of air either in or out of the lungs. The body is able to stay at the dimensions of the lungs because of the relationship of the lungs to the thoracic wall. Each lung is completely enclosed in a sac called the pleural sac. Two structures contribute to the formation of this sac. The parietal pleura is attached to the thoracic wall where as the visceral pleura is attached to the lung itself. In-between these two membranes is a thin layer of intrapleural fluid. The intrapleural fluid completely surrounds the lungs and lubricates the two surfaces so that they can slide across each other. Changing the pressure of this fluid also allows the lungs and the thoracic wall to move together during normal breathing. Much the way two glass slides with water in-between them are difficult to pull apart, such is the relationship of the lungs to the thoracic wall. The rhythm of ventilation is also controlled by the "Respiratory Center" which is located largely in the medulla oblongata of the brain stem. This is part of the autonomic system and as such is not controlled voluntarily (one can increase or decrease breathing rate voluntarily, but that involves a different part of the brain). While resting, the respiratory center sends out action potentials that travel along the phrenic nerves into the diaphragm and the external intercostal muscles of the rib cage, causing inhalation. Relaxed exhalation occurs between impulses when the muscles relax. Normal adults have a breathing rate of 12-20 respirations per minute. When one breathes air in at sea level, the inhalation is composed of different gases. These gases and their quantities are Oxygen which makes up 21%, Nitrogen which is 78%, Carbon Dioxide with 0.04% and others with significantly smaller portions. In the process of breathing, air enters into the nasal cavity through the nostrils and is filtered by coarse hairs (vibrissae) and mucous that are found there. The vibrissae filter macroparticles, which are particles of large size. Dust, pollen, smoke, and fine particles are trapped in the mucous that lines the nasal cavities (hollow spaces within the bones of the skull that warm, moisten, and filter the air). There are three bony projections inside the nasal cavity. The superior, middle, and inferior nasal conchae. Air passes between these conchae via the nasal meatuses. 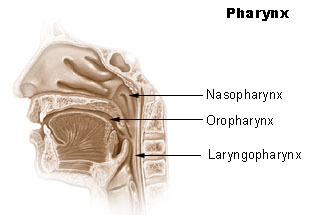 Air then travels past the nasopharynx, oropharynx, and laryngopharynx, which are the three portions that make up the pharynx. The pharynx is a funnel-shaped tube that connects our nasal and oral cavities to the larynx. The tonsils which are part of the lymphatic system, form a ring at the connection of the oral cavity and the pharynx. Here, they protect against foreign invasion of antigens. Therefore, the respiratory tract aids the immune system through this protection. Then the air travels through the larynx. The larynx closes at the epiglottis to prevent the passage of food or drink as a protection to our trachea and lungs. The larynx is also our voicebox; it contains vocal cords, in which it produces sound. Sound is produced from the vibration of the vocal cords when air passes through them. The trachea, which is also known as our windpipe, has ciliated cells and mucous secreting cells lining it, and is held open by C-shaped cartilage rings. One of its functions is similar to the larynx and nasal cavity, by way of protection from dust and other particles. The dust will adhere to the sticky mucous and the cilia helps propel it back up the trachea, to where it is either swallowed or coughed up. The mucociliary escalator extends from the top of the trachea all the way down to the bronchioles, which we will discuss later. Through the trachea, the air is now able to pass into the bronchi, bronchioles and finally alveoli before entering the pulmonary capillaries. There is lots of oxygen and then there is less carbon dioxide when the air comes in, but when it diffuses, the amounts exchange. All of this happens in seconds. Inspiration is initiated by contraction of the diaphragm and in some cases the intercostals muscles when they receive nervous impulses. During normal quiet breathing, the phrenic nerve stimulates the diaphragm to contract and move downward into the abdomen. This downward movement of the diaphragm enlarges the thorax. When necessary, the intercostal muscles also increase the thorax by contacting and drawing the ribs upward and outward. As the diaphragm contracts inferiorly and thoracic muscles pull the chest wall outwardly, the volume of the thoracic cavity increases. The lungs are held to the thoracic wall by negative pressure in the pleural cavity, a very thin space filled with a few milliliters of lubricating pleural fluid. The negative pressure in the pleural cavity is enough to hold the lungs open in spite of the inherent elasticity of the tissue. Hence, as the thoracic cavity increases in volume the lungs are pulled from all sides to expand, causing a drop in the pressure (a partial vacuum) within the lung itself (but note that this negative pressure is still not as great as the negative pressure within the pleural cavity--otherwise the lungs would pull away from the chest wall). Assuming the airway is open, air from the external environment then follows its pressure gradient down and expands the alveoli of the lungs, where gas exchange with the blood takes place. As long as pressure within the alveoli is lower than atmospheric pressure air will continue to move inwardly, but as soon as the pressure is stabilized air movement stops. During quiet breathing, expiration is normally a passive process and does not require muscles to work (rather it is the result of the muscles relaxing). When the lungs are stretched and expanded, stretch receptors within the alveoli send inhibitory nerve impulses to the medulla oblongata, causing it to stop sending signals to the rib cage and diaphragm to contract. The muscles of respiration and the lungs themselves are elastic, so when the diaphragm and intercostal muscles relax there is an elastic recoil, which creates a positive pressure (pressure in the lungs becomes greater than atmospheric pressure), and air moves out of the lungs by flowing down its pressure gradient. Although the respiratory system is primarily under involuntary control, and regulated by the medulla oblongata, we have some voluntary control over it also. This is due to the higher brain function of the cerebral cortex. When under physical or emotional stress, more frequent and deep breathing is needed, and both inspiration and expiration will work as active processes. Additional muscles in the rib cage forcefully contract and push air quickly out of the lungs. In addition to deeper breathing, when coughing or sneezing we exhale forcibly. Our abdominal muscles will contract suddenly (when there is an urge to cough or sneeze), raising the abdominal pressure. The rapid increase in pressure pushes the relaxed diaphragm up against the pleural cavity. This causes air to be forced out of the lungs. Another function of the respiratory system is to sing and to speak. By exerting conscious control over our breathing and regulating flow of air across the vocal cords we are able to create and modify sounds. Lung Compliance is the magnitude of the change in lung volume produced by a change in pulmonary pressure. Compliance can be considered the opposite of stiffness. A low lung compliance would mean that the lungs would need a greater than average change in intrapleural pressure to change the volume of the lungs. A high lung compliance would indicate that little pressure difference in intrapleural pressure is needed to change the volume of the lungs. More energy is required to breathe normally in a person with low lung compliance. Persons with low lung compliance due to disease therefore tend to take shallow breaths and breathe more frequently. Determination of Lung Compliance Two major things determine lung compliance. The first is the elasticity of the lung tissue. Any thickening of lung tissues due to disease will decrease lung compliance. The second is surface tensions at air water interfaces in the alveoli. The surface of the alveoli cells is moist. The attractive force, between the water cells on the alveoli, is called surface tension. Thus, energy is required not only to expand the tissues of the lung but also to overcome the surface tension of the water that lines the alveoli. To overcome the forces of surface tension, certain alveoli cells (Type II pneumocytes) secrete a protein and lipid complex called ""Surfactant””, which acts like a detergent by disrupting the hydrogen bonding of water that lines the alveoli, hence decreasing surface tension. The upper respiratory tract consists of the nose and the pharynx. Its primary function is to receive the air from the external environment and filter, warm, and humidify it before it reaches the delicate lungs where gas exchange will occur. Air enters through the nostrils of the nose and is partially filtered by the nose hairs, then flows into the nasal cavity. The nasal cavity is lined with epithelial tissue, containing blood vessels, which help warm the air; and secrete mucous, which further filters the air. The endothelial lining of the nasal cavity also contains tiny hairlike projections, called cilia. The cilia serve to transport dust and other foreign particles, trapped in mucous, to the back of the nasal cavity and to the pharynx. There the mucus is either coughed out, or swallowed and digested by powerful stomach acids. After passing through the nasal cavity, the air flows down the pharynx to the larynx. The lower respiratory tract starts with the larynx, and includes the trachea, the two bronchi that branch from the trachea, and the lungs themselves. This is where gas exchange actually takes place. The larynx (plural larynges), colloquially known as the voice box, is an organ in our neck involved in protection of the trachea and sound production. The larynx houses the vocal cords, and is situated just below where the tract of the pharynx splits into the trachea and the esophagus. The larynx contains two important structures: the epiglottis and the vocal cords. The epiglottis is a flap of cartilage located at the opening to the larynx. During swallowing, the larynx (at the epiglottis and at the glottis) closes to prevent swallowed material from entering the lungs; the larynx is also pulled upwards to assist this process. Stimulation of the larynx by ingested matter produces a strong cough reflex to protect the lungs. Note: choking occurs when the epiglottis fails to cover the trachea, and food becomes lodged in our windpipe. The vocal cords consist of two folds of connective tissue that stretch and vibrate when air passes through them, causing vocalization. The length the vocal cords are stretched determines what pitch the sound will have. The strength of expiration from the lungs also contributes to the loudness of the sound. Our ability to have some voluntary control over the respiratory system enables us to sing and to speak. In order for the larynx to function and produce sound, we need air. That is why we can't talk when we're swallowing. Homeostasis is maintained by the respiratory system in two ways: gas exchange and regulation of blood pH. Gas exchange is performed by the lungs by eliminating carbon dioxide, a waste product given off by cellular respiration. As carbon dioxide exits the body, oxygen needed for cellular respiration enters the body through the lungs. ATP, produced by cellular respiration, provides the energy for the body to perform many functions, including nerve conduction and muscle contraction. Lack of oxygen affects brain function, sense of judgment, and a host of other problems. Gas exchange in the lungs and in the alveoli is between the alveolar air and the blood in the pulmonary capillaries. This exchange is a result of increased concentration of oxygen, and a decrease of C02. This process of exchange is done through diffusion. External respiration is the exchange of gas between the air in the alveoli and the blood within the pulmonary capillaries. A normal rate of respiration is 12-25 breaths per minute. In external respiration, gases diffuse in either direction across the walls of the alveoli. Oxygen diffuses from the air into the blood and carbon dioxide diffuses out of the blood into the air. Most of the carbon dioxide is carried to the lungs in plasma as bicarbonate ions (HCO3-). When blood enters the pulmonary capillaries, the bicarbonate ions and hydrogen ions are converted to carbonic acid (H2CO3) and then back into carbon dioxide (CO2) and water. This chemical reaction also uses up hydrogen ions. The removal of these ions gives the blood a more neutral pH, allowing hemoglobin to bind up more oxygen. De-oxygenated blood "blue blood" coming from the pulmonary arteries, generally has an oxygen partial pressure (pp) of 40 mmHg and CO2 pp of 45 mmHg. Oxygenated blood leaving the lungs via the pulmonary veins has an O2 pp of 100 mmHg and CO2 pp of 40 mmHg. It should be noted that alveolar O2 pp is 105 mmHg, and not 100 mmHg. The reason why pulmonary venous return blood has a lower than expected O2 pp can be explained by "Ventilation Perfusion Mismatch". Internal respiration is the exchanging of gases at the cellular level. There is a point at the inferior portion of the trachea where it branches into two directions that form the right and left primary bronchus. This point is called the Carina which is the keel-like cartilage plate at the division point. We are now at the Bronchial Tree. It is named so because it has a series of respiratory tubes that branch off into smaller and smaller tubes as they run throughout the lungs. The Right Primary Bronchus is the first portion we come to, it then branches off into the Lobar (secondary) Bronchi, Segmental (tertiary) Bronchi, then to the Bronchioles which have little cartilage and are lined by simple cuboidal epithelium (See fig. 1). The bronchi are lined by pseudostratified columnar epithelium. Objects will likely lodge here at the junction of the Carina and the Right Primary Bronchus because of the vertical structure. Items have a tendency to fall in it, where as the Left Primary Bronchus has more of a curve to it which would make it hard to have things lodge there. The Left Primary Bronchus has the same setup as the right with the lobar, segmental bronchi and the bronchioles. The lungs are attached to the heart and trachea through structures that are called the roots of the lungs. The roots of the lungs are the bronchi, pulmonary vessels, bronchial vessels, lymphatic vessels, and nerves. These structures enter and leave at the hilus of the lung which is "the depression in the medial surface of a lung that forms the opening through which the bronchus, blood vessels, and nerves pass" (medlineplus.gov). There are a number of terminal bronchioles connected to respiratory bronchioles which then advance into the alveolar ducts that then become alveolar sacs. Each bronchiole terminates in an elongated space enclosed by many air sacs called alveoli which are surrounded by blood capillaries. Present there as well, are Alveolar Macrophages, they ingest any microbes that reach the alveoli. The Pulmonary Alveoli are microscopic, which means they can only be seen through a microscope, membranous air sacs within the lungs. They are units of respiration and the site of gas exchange between the respiratory and circulatory systems. First the oxygen must diffuse from the alveolus into the capillaries. It is able to do this because the capillaries are permeable to oxygen. After it is in the capillary, about 5% will be dissolved in the blood plasma. The other oxygen will bind to red blood cells. The red blood cells contain hemoglobin that carries oxygen. Blood with hemoglobin is able to transport 26 times more oxygen than plasma without hemoglobin. Our bodies would have to work much harder pumping more blood to supply our cells with oxygen without the help of hemoglobin. Once it diffuses by osmosis it combines with the hemoglobin to form oxyhemoglobin. Now the blood carrying oxygen is pumped through the heart to the rest of the body. Oxygen will travel in the blood into arteries, arterioles, and eventually capillaries where it will be very close to body cells. Now with different conditions in temperature and pH (warmer and more acidic than in the lungs), and with pressure being exerted on the cells, the hemoglobin will give up the oxygen where it will diffuse to the cells to be used for cellular respiration, also called aerobic respiration. Cellular respiration is the process of moving energy from one chemical form (glucose) into another (ATP), since all cells use ATP for all metabolic reactions. It is in the mitochondria of the cells where oxygen is actually consumed and carbon dioxide produced. Oxygen is produced as it combines with hydrogen ions to form water at the end of the electron transport chain (see chapter on cells). As cells take apart the carbon molecules from glucose, these get released as carbon dioxide. Each body cell releases carbon dioxide into nearby capillaries by diffusion, because the level of carbon dioxide is higher in the body cells than in the blood. In the capillaries, some of the carbon dioxide is dissolved in plasma and some is taken by the hemoglobin, but most enters the red blood cells where it binds with water to form carbonic acid. It travels to the capillaries surrounding the lung where a water molecule leaves, causing it to turn back into carbon dioxide. It then enters the lungs where it is exhaled into the atmosphere. The normal volume moved in or out of the lungs during quiet breathing is called tidal volume. When we are in a relaxed state, only a small amount of air is brought in and out, about 500 mL. You can increase both the amount you inhale, and the amount you exhale, by breathing deeply. Breathing in very deeply is Inspiratory Reserve Volume and can increase lung volume by 2900 mL, which is quite a bit more than the tidal volume of 500 mL. We can also increase expiration by contracting our thoracic and abdominal muscles. This is called expiratory reserve volume and is about 1400 ml of air. Vital capacity is the total of tidal, inspiratory reserve and expiratory reserve volumes; it is called vital capacity because it is vital for life, and the more air you can move, the better off you are. There are a number of illnesses that we will discuss later in the chapter that decrease vital capacity. Vital Capacity can vary a little depending on how much we can increase inspiration by expanding our chest and lungs. Some air that we breathe never even reaches the lungs! Instead it fills our nasal cavities, trachea, bronchi, and bronchioles. These passages aren't used in gas exchange so they are considered to be dead air space. To make sure that the inhaled air gets to the lungs, we need to breathe slowly and deeply. Even when we exhale deeply some air is still in the lungs,(about 1000 ml) and is called residual volume. This air isn't useful for gas exchange. There are certain types of diseases of the lung where residual volume builds up because the person cannot fully empty the lungs. This means that the vital capacity is also reduced because their lungs are filled with useless air. There are two pathways of motor neuron stimulation of the respiratory muscles. The first is the control of voluntary breathing by the cerebral cortex. The second is involuntary breathing controlled by the medulla oblongata. There are chemoreceptors in the aorta, the carotid body of carotid arteries, and in the medulla oblongata of the brainstem that are sensitive to pH. As carbon dioxide levels increase there is a buildup of carbonic acid, which releases hydrogen ions and lowers pH. Thus, the chemoreceptors do not respond to changes in oxygen levels (which actually change much more slowly), but to pH, which is dependent upon plasma carbon dioxide levels. In other words, CO2 is the driving force for breathing. The receptors in the aorta and the carotid sinus initiate a reflex that immediately stimulates breathing rate and the receptors in the medulla stimulate a sustained increase in breathing until blood pH returns to normal. This response can be experienced by running a 100-meter dash. During this exertion (or any other sustained exercise) your muscle cells must metabolize ATP at a much faster rate than usual, and thus will produce much higher quantities of CO2. The blood pH drops as CO2 levels increase, and you will involuntarily increase breathing rate very soon after beginning the sprint. You will continue to breathe heavily after the race, thus expelling more carbon dioxide, until pH has returned to normal. Metabolic acidosis therefore is acutely corrected by respiratory compensation (hyperventilation). Many of us are not aware of the importance of maintaining the acid/base balance of our blood. It is vital to our survival. Normal blood pH is set at 7.4, which is slightly alkaline or "basic". If the pH of our blood drops below 7.2 or rises above 7.6 then very soon our brains would cease functioning normally and we would be in big trouble. Blood pH levels below 6.9 or above 7.9 are usually fatal if they last for more than a short time. Another wonder of our amazing bodies is the ability to cope with every pH change – large or small. There are three factors in this process: the lungs, the kidneys and buffers. So what exactly is pH? pH is the concentration of hydrogen ions (H+). Buffers are molecules which take in or release ions in order to maintain the H+ ion concentration at a certain level. When blood pH is too low and the blood becomes too acidic (acidosis), the presence of too many H+ ions is to blame. Buffers help to soak up those extra H+ ions. On the other hand, the lack of H+ ions causes the blood to be too basic (alkalosis). In this situation, buffers release H+ ions. Buffers function to maintain the pH of our blood by either donating or grabbing H+ ions as necessary to keep the number of H+ ions floating around the blood at just the right amount. The most important buffer we have in our bodies is a mixture of carbon dioxide (CO2) and bicarbonate ion (HCO3). CO2 forms carbonic acid (H2CO3) when it dissolves in water and acts as an acid giving up hydrogen ions (H+) when needed. HCO3 is a base and soaks up hydrogen ions (H+) when there are too many of them. In a nutshell, blood pH is determined by a balance between bicarbonate and carbon dioxide. If pH is too high, carbonic acid will donate hydrogen ions (H+) and pH will drop. If pH is too low, bicarbonate will bond with hydrogen ions (H+) and pH will rise. Too much CO2 or too little HCO3 in the blood will cause acidosis. The CO2 level is increased when hypoventilation or slow breathing occurs, such as if you have emphysema or pneumonia. Bicarbonate will be lowered by ketoacidosis, a condition caused by excess fat metabolism (diabetes mellitus). Too much HCO3 or too little CO2 in the blood will cause alkalosis. This condition is less common than acidosis. CO2 can be lowered by hyperventilation. So, in summary, if you are going into respiratory acidosis the above equation will move to the right. The body's H+ and CO2 levels will rise and the pH will drop. To counteract this the body will breathe more and release H+. In contrast, if you are going into respiratory alkalosis the equation will move to the left. The body's H+ and CO2 levels will fall and the pH will rise. So the body will try to breathe less to release HCO3. You can think of it like a leak in a pipe: where ever there is a leak, the body will "fill the hole". The environment of the lung is very moist, which makes it a hospitable environment for bacteria. Many respiratory illnesses are the result of bacterial or viral infection of the lungs. Because we are constantly being exposed to harmful bacteria and viruses in our environment, our respiratory health can be adversely affected. There are a number of illnesses and diseases that can cause problems with breathing. Some are simple infections, and others are disorders that can be quite serious. Carbon Monoxide Poisoning: caused when carbon monoxide binds to hemoglobin in place of oxygen. Carbon monoxide binds much tighter, without releasing, causing the hemoglobin to become unavailable to oxygen. The result can be fatal in a very short amount of time. Severe Symptoms: seizures, palpitations, disorientation, irregular heart beat, low blood pressure, coma and death. Pulmonary Embolism: blockage of the pulmonary artery (or one of its branches) by a blood clot, fat, air or clumped tumor cells. By far the most common form of pulmonary embolism is a thromboembolism, which occurs when a blood clot, generally a venous thrombus, becomes dislodged from its site of formation and embolizes to the arterial blood supply of one of the lungs. Symptoms may include difficulty breathing, pain during breathing, and more rarely circulatory instability and death. Treatment, usually, is with anticoagulant medication. The upper respiratory tract consists of our nasal cavities, pharynx, and larynx. Upper respiratory infections (URI) can spread from our nasal cavities to our sinuses, ears, and larynx. Sometimes a viral infection can lead to what is called a secondary bacterial infection. "Strep throat" is a primary bacterial infection and can lead to an upper respiratory infection that can be generalized or even systemic (affects the body as a whole). Antibiotics aren't used to treat viral infections, but are successful in treating most bacterial infections, including strep throat. The symptoms of strep throat can be a high fever, severe sore throat, white patches on a dark red throat, and stomach ache. An infection of the cranial sinuses is called sinusitis. Only about 1-3% of URI's are accompanied by sinusitis. This "sinus infection" develops when nasal congestion blocks off the tiny openings that lead to the sinuses. Some symptoms include: post nasal discharge, facial pain that worsens when bending forward, and sometimes even tooth pain can be a symptom. Successful treatment depends on restoring the proper drainage of the sinuses. Taking a hot shower or sleeping upright can be very helpful. Otherwise, using a spray decongestant or sometimes a prescribed antibiotic will be necessary. Otitis media in an infection of the middle ear. Even though the middle ear is not part of the respiratory tract, it is discussed here because it is often a complication seen in children who has a nasal infection. The infection can be spread by way of the 'auditory (Eustachian) tube that leads form the nasopharynx to the middle ear. The main symptom is usually pain. Sometimes though, vertigo, hearing loss, and dizziness may be present. Antibiotics can be prescribed and tubes are placed in the eardrum to prevent the buildup of pressure in the middle ear and the possibility of hearing loss. Tonsillitis occurs when the tonsils become swollen and inflamed. The tonsils located in the posterior wall of the nasopharynx are often referred to as adenoids. If you suffer from tonsillitis frequently and breathing becomes difficult, they can be removed surgically in a procedure called a tonsillectomy. An infection of the larynx is called laryngitis. It is accompanied by hoarseness and being unable to speak in an audible voice. Usually, laryngitis disappears with treatment of the URI. Persistent hoarseness without a URI is a warning sign of cancer, and should be checked into by your physician. Lower respiratory tract disorders include infections, restrictive pulmonary disorders, obstructive pulmonary disorders, and lung cancer. An infection that is located in the primary and secondary bronchi is called bronchitis. Most of the time, it is preceded by a viral URI that led to a secondary bacterial infection. Usually, a nonproductive cough turns into a deep cough that will expectorate mucus and sometimes pus. A bacterial or viral infection in the lungs where the bronchi and the alveoli fill with a thick fluid. Usually it is preceded by influenza. Symptoms of pneumonia include high fever & chills, with headache and chest pain. Pneumonia can be located in several lobules of the lung and obviously, the more lobules involved, the more serious the infection. It can be caused by a bacteria that is usually held in check, but due to stress or reduced immunity has gained the upper hand. Vital capacity is reduced in these types of disorders because the lungs have lost their elasticity. Inhaling particles such as sand, asbestos, coal dust, or fiberglass can lead to pulmonary fibrosis, a condition where fibrous tissue builds up in the lungs. This makes it so our lungs cannot inflate properly and are always tending toward deflation. Diagram of the lungs during an asthma attack. Asthma is a respiratory disease of the bronchi and bronchioles. The symptoms include wheezing, shortness of breath, and sometimes a cough that will expel mucus. The airways are very sensitive to irritants which can include pollen, dust, animal dander, and tobacco. Even being out in cold air can be an irritant. When exposed to an irritant, the smooth muscle in the bronchioles undergoes spasms. Most asthma patients have at least some degree of bronchial inflammation that reduces the diameter of the airways and contributes to the seriousness of the attack. Emphysema is a type of chronic obstructive pulmonary disease. Typically characterized by a loss of elasticity and surfactant in the alveoli, a loss of surface area decreases the gas exchange in the lungs. These patients have difficulty with too little expiratory pressure, not retaining inspired air long enough for sufficient gas exchange to happen. Another type of chronic obstructive pulmonary disease, Chronic Bronchitis is caused by overproduction of mucus in the airways, causing an inadequate expiration of inspired air. Retention of air in the lungs reduces gas exchange at the alveoli, and can lead to a hypoxic drive. These patients are known as "blue bloaters", vulnerable to cyanosis and often have increased thoracic diameters. At birth the pressure needed to expand the lungs requires high inspiratory pressure. In the presence of normal surfactant levels the lungs retain as much as 40% of the residual volume after the first breath and thereafter will only require far lower inspiratory pressures. In the case of deficiency of surfactant the lungs will collapse between breaths, this makes the infant work hard and each breath is as hard as the first breath. If this goes on further the pulmonary capillary membranes become more permeable, letting in fibrin rich fluids between the alveolar spaces and in turn forms a hyaline membrane. The hyaline membrane is a barrier to gas exchange, this hyaline membrane then causes hypoxemia and carbon dioxide retention that in turn will further impair surfactant production. Type two alveolar cells produce surfactant and do not develop until the 25th to the 28th week of gestation, in this, respiratory distress syndrome is one of the most common respiratory disease in premature infants. Furthermore, surfactant deficiency and pulmonary immaturity together leads to alveolar collapse. Predisposing factors that contribute to poorly functioning type II alveolar cells in a premature baby are if the child is a preterm male, white infants, infants of mothers with diabetes, precipitous deliveries, cesarean section performed before the 38th week of gestation. Surfactant synthesis is influenced by hormones, this ranges form insulin and cortisol. Insulin inhibits surfactant production, explaining why infants of mothers with diabetes type 1 are at risk of development of respiratory distress syndrome. Cortisol can speed up maturation of type II cells and therefore production of surfactant. Finally, in the baby delivered by cesarean section are at greater risk of developing respiratory distress syndrome because the reduction of cortisol produced because the lack of stress that happens during vaginal delivery, hence cortisol increases in high stress and helps in the maturation of type II cells of the alveoli that cause surfactant. Today to prevent respiratory distress syndrome are animal sources and synthetic surfactants, and administrated through the airways by an endotracheal tube and the surfactant is suspended in a saline solution. Treatment is initiated post birth and in infants who are at high risk for respiratory distress syndrome. CPAP is the most common treatment for obstructive sleep apnea. Sleep apnea or sleep apnoea is a sleep disorder characterized by pauses in breathing during sleep. These episodes, called apneas (literally, "without breath"), each last long enough so one or more breaths are missed, and occur repeatedly throughout sleep. The standard definition of any apneic event includes a minimum 10 second interval between breaths, with either a neurological arousal (3-second or greater shift in EEG frequency, measured at C3, C4, O1, or O2), or a blood oxygen desaturation of 3-4 percent or greater, or both arousal and desaturation. Sleep apnea is diagnosed with an overnight sleep test called polysomnogram. One method of treating central sleep apnea is with a special kind of CPAP, APAP, or VPAP machine with a Spontaneous Time (ST) feature. This machine forces the wearer to breathe a constant number of breaths per minute. (CPAP), or continuous positive airway pressure, in which a controlled air compressor generates an airstream at a constant pressure. This pressure is prescribed by the patient's physician, based on an overnight test or titration. Nutrition is particularly important for ventilator-dependent patient. When metabolizing macronutrients carbon dioxide and water are produced. The respiratory quotient (RQ) is a ratio of produced carbon dioxide to amount consumed. Carbohydrates metabolism produces the most amount of carbon dioxide so they have the highest (RQ). Fats produce the least amount of carbon dioxide along with proteins. Protein has a slightly higher RQ ratio. It is recommended that this kind of patient not exceed a 1.0 respiratory quotient (RQ). Lowering carbohydrates and supplementing fat or protein in the diet might not result in maintaining the desired outcome because, excess amounts fat or protein may also result in a respiratory quotient (RQ) higher than 1.0. This disease is most common in Caucasians and will happen to 1 in every 2500 people. It is most known for its effects on the respiratory tract although it does effect other systems as well. The respiratory passages become clogged with a thick mucus that is difficult to expel even with vigorous coughing. Breathing becomes difficult and affected individuals run the risk of choking to death on their own secretions unless strenuous effort is made to clear the lungs multiple times every day. Victims frequently will die in the 20's of pneumonia. All of us secrete mucus by certain cells in the epithelium that line the respiratory passageways. In normal cases the cells also secrete a watery fluid that will dilute the mucus making it easier to pass through the airways. In cystic fibrosis that secretion of watery fluid is impaired. This makes the mucus thicker and difficult to clear from the passageways. A recent discovery found that in cystic fibrosis is caused by a defect in a type of chloride protein found in apical membranes of epithelial calls in the respiratory system and elsewhere. This defect directly impedes the chlorine ions transport, which will then indirectly effect the transport of potassium ions. This causes the epithelium, to not create its osmotic gradient necessary for water secretion. It has been known for a long time that cystic fibrosis is caused by a recessive gene inheritance. This gene codes for a portion of the chloride channel protein, which can malfunction in a variety of ways, each with specific treatment required. Mader, Sylvia S. Human Biology. McGraw Hill Publishing, Burr Ridge, IL. 2004. In depth anatomy and physiology of the pulmonary system.